$16.99 (Softback Copy) plus $1.50 shipping and handling! See how you can offer the book on your site to your customers by contacting us. This book is primarily a collection of articles that have been previously printed in the United States. You will find many survival articles here that have been published in some of North America 's better Outdoor publications (Modern Survival Magazine, Buck Masters, Big Game Hunt, Wonderful West Virginia Magazine, Back Home Magazine, Family Camping Magazine and many others). Additionally, you will find some great general outdoor information in the book as well that has not been published previously. However, please keep in mind, wilderness survival is a very dangerous situation . And, as such, your decisions in the wild and what you have on hand could mean the difference between life and death. That is why many of the articles contain varies types of suggested survival kits and the contents are listed. To venture out of doors without a survival kit, in the author's opinion, is extremely dangerous. And, since each time you enter the field the weather conditions and other circumstances are different, it also makes sense that your survival kit and clothing should be a little different for each trip. This survival and outdoors book is over 320 pages in length and is for your enjoyment, reference, or perhaps to get you to thinking about survival preparedness. Gary has over forty years of wilderness outdoors experience and he has camped in various states and countries, as well as under some very extreme weather conditions. Having camped in the steaming jungles of the Philippines Islands, the frozen arctic north of Alaska, the sandy beaches of Mexico, and the burning deserts of Arizona and New Mexico, he feels his knowledge base is extensive. 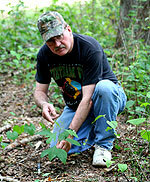 For more information about Gary's professional survival experience visit his survival site. The book has been broken down into different categories to make your subject search easier. Survival Tips (Illustrations throughout the book) and much more! Keep in mind some of Gary 's writing is just plain camping, fishing, hiking, or hunting information. You will also find some general information about how to expose children to nature, or what to do in an emergency with children along. Gary has added this section to make the book more enjoyable for those folks who may be looking for general wilderness information or simply want to teach a child more about nature. 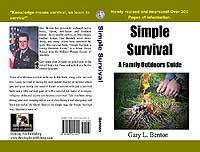 Simple Survival was prepared for those who wish to improve or learn emergency survival skills. It was written for nature lovers, hunters, hikers, fishermen, campers, or those that travel on the world's highways and back roads. As Gary often says, "Knowledge Means survival, so learn to survive!"